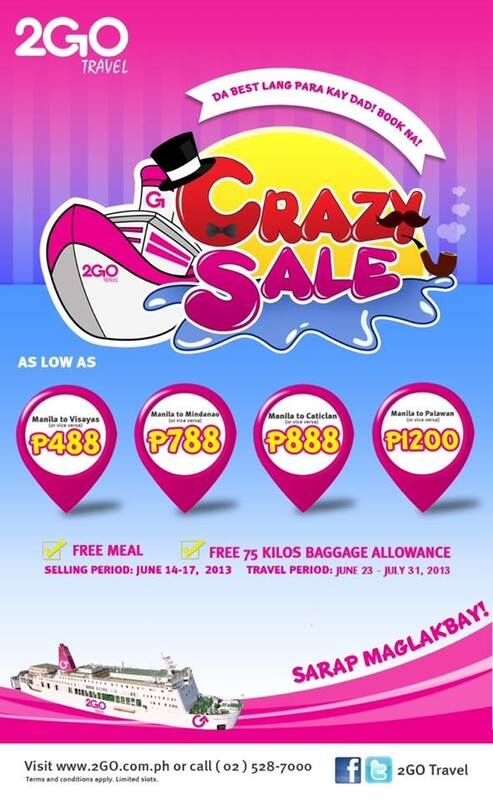 Today will be your last chance to avail of our Crazy Sale Promo. HURRY and BUY your tickets NOW!!! Visit our website at www.2go.com.ph or call (02)528-7000 for ticket delivery. To join the rest of the Filipinos in commemorating Independence Day, 2GO Travel presents Freedom Fest @ The Hub, a free concert on Tuesday, 7:00 p.m., June 11, 2013 to be held at the premier sea travel carrier’s upscale lounge facility located at the Bulwagan ng Kagitingan, Rizal Park, Luneta, Manila (just across the Rizal Monument and beside the Chinese Garden). 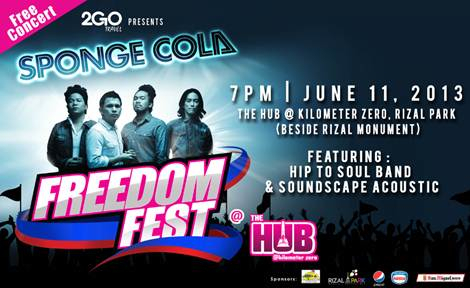 Freedom Fest @ The Hub showcases popular rock band Sponge Cola and features Hip to Soul Band and Soundscape Acoustic. The concert is sponsored by Nestlé ice cream, San Miguel and Pepsi. 2GO Travel, is the new brand name of the country’s leading passenger ships Negros Navigation, Superferry, Cebu Ferries, and Supercat. Held at Hotel Centro in the City of Puerto Princesa, the country’s premier sea travel carrier 2GO TRAVEL recently launched its new route to the Eco-Tourism Center of the Philippines via Coron. Held at Hotel Centro in the City of Puerto Princesa, the country’s premier sea travel carrier 2GO TRAVEL recently launched its new route to the Eco-Tourism Center of the Philippines via Coron. 2GO TRAVEL Partners in Puerto Princesa gathered at the launch, which was graced by officials from the different government agencies, hotel and outlet owners, members of the media, partners from the academe and some members of the shipping industry. In her message, Provincial Tourism Head Maribel Buni cited that the province aims to increase the number of tourist by 25% this year. She expressed her high spirits that the said target can be achieved faster through the re-entry of 2GO TRAVEL in the port of Puerto Princesa. 2GO TRAVEL Vice President and Passage Business Commercial Officer Stephen Rey Tagud sought the support of the people of Palawan to ensure the continuous service of their new route. He mentioned that in addition to the improvement of vessel facilities of MV St. Augustine of Hippo, passengers will be provided a cruise-like experience and will be given a chance to try out the new passenger terminal facility at Manila North Harbor as well as stay at The Hub at Kilometer Zero, which serves as the lounge for cabin or stateroom passengers or group travelers.